Late last month, I was sort of half joking with J when I pointed out that one of my favorite breweries was doing an Advent Calendar. I mentioned it the day it went on sale then promptly forgot about it myself. J didn’t forget. She actually got online and ordered one when they went on sale. Merry Christmas! The order was placed before Thanksgiving with pick up being available at the end of November. Normally, that wouldn’t be a problem….except J had a baby on Black Friday. Now, I know you’re thinking, why didn’t you just go it? I would have, but she bought it so she had to pick it up. We’ve noticed B pretty much falls asleep instantly when we put him in his car seat, so a little over a week after he was born, we decided to try out our first road trip with two kids. The first thing we learned is that it takes longer to get two kids out of the house. The brewery that put together this amazing box of beers is Greenbush Brewing Company in Sawyer. Our plan was to leave Kalamazoo around 10:30 so we could get to Sawyer around 11:30 as the taproom was opening. 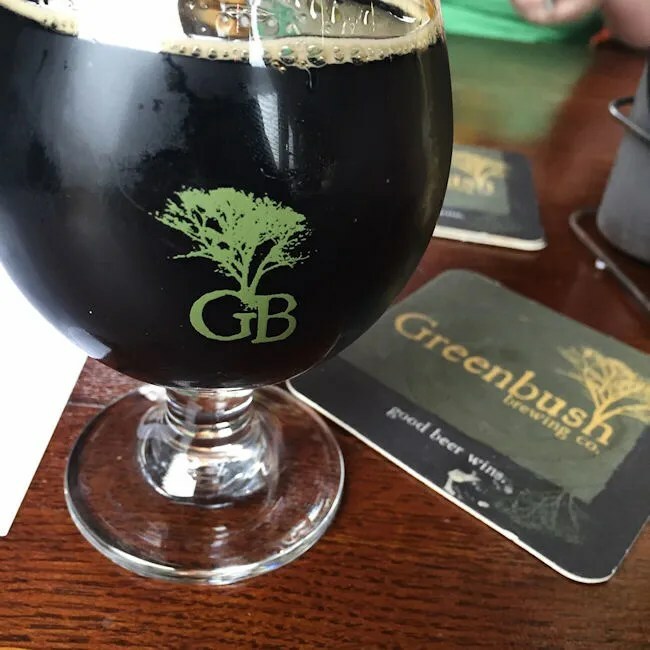 I had stopped at Greenbush once in the past for lunch and a beer, but J had never eaten there. We had to go anyway, so why not pick up lunch? We left a little later than we expected, so we actually rolled in to Sawyer a little after noon. Still, it was a Tuesday afternoon, the brewery wouldn’t be packed…..right? 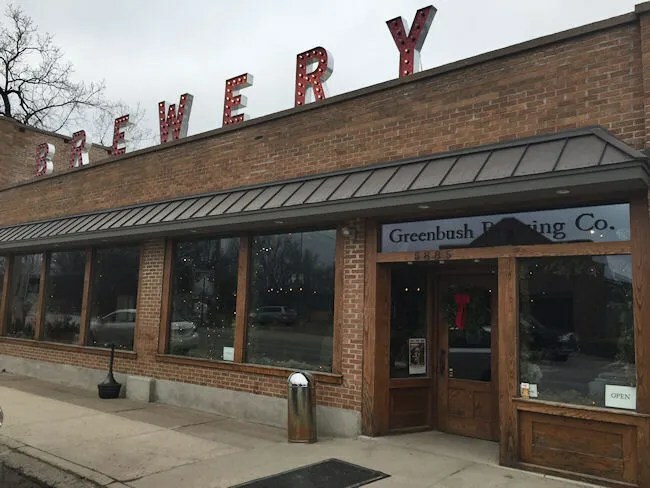 Greenbush Brewing Company is right across the tracks in downtown Sawyer. It’s just a short drive off I-94 at the Sawyer exit. Greenbush actually has two buildings in downtown Sawyer. The original building is the taproom and that’s where we were heading for lunch. Across the street is The Annex. They have a large beer garden with charcuterie and sausages on the weekends. The Annex is also where all their merchandise and beer for sale is housed. We actually needed to stop at The Annex to pick up the Advent Calendar that we drove to Sawyer for. I have to be honest. I was shocked when we crossed over the tracks and almost every parking spot along Sawyer Road was full. Yes, it was lunch time, but it was also the middle of the week. We found the last street parking spot in front of The Annex and walked back across the street to the brewery with the plan to get my beer on our way out of town. The Taproom isn’t hard to find. It’s the only building in downtown Sawyer with the word “BREWERY” in large letters on top of it. This building has been Greenbush’s home since 2011. They’ve expanded the space three times since then…and it’s still not nearly enough. The four of us walked in to the taproom a little after noon. There’s a hostess station right inside the door. We were told…on a Tuesday afternoon…there was a 15-20 minute wait. We apparently just hit the lunch rush as the hostess said she had just seated several tables. She offered to take a phone number and offered us a spot at the bar while we waited. We had two kids though and even though she said both were welcome to wait there, we decided to head back across the street to The Annex and pick up my beer. We were told the wait was going to be closer to 20 minutes but I think it turned in to less than 10. As I was loading beer into the car, J got a text saying our table was ready….it turned out to be a less than 10 minute wait. When we walked back in to the Taproom, the hostess asked if a pub table was ok. That was fine with us. L is big enough to sit still and we have a higher table at home, so that wasn’t a big deal. 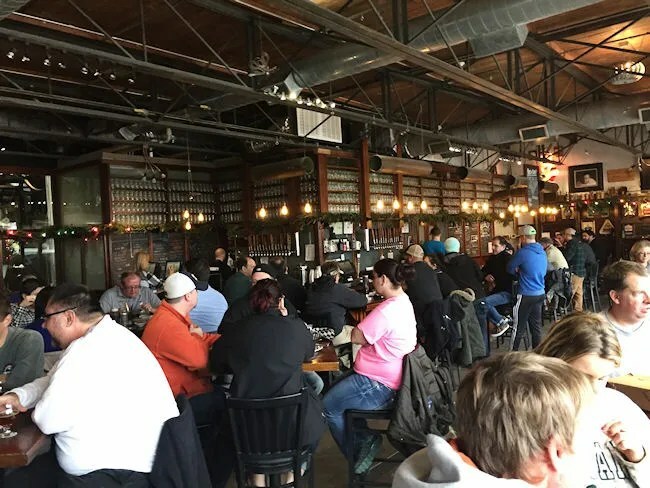 I was able to put B on a chair in the corner so he was out of the way and we were able to enjoy our lunch without bothering anyone else…although we weren’t the only family in the place and the Taproom was a little loud seeing as how it was full. We happened to be in Sawyer on the day that Delusion was released, so I started with that. It was a little pricey being on their top tier list. The 10 oz. snifter of delicious beer set me back $8.50, but the barrel aged Imperial Cream Stout was worth the price. I picked up a few bottles at the Annex before we left and I’ve noticed that there are a couple in my Advent Calendar as well. When J drinks beer, she goes for the lighter stuff and fruit beers. 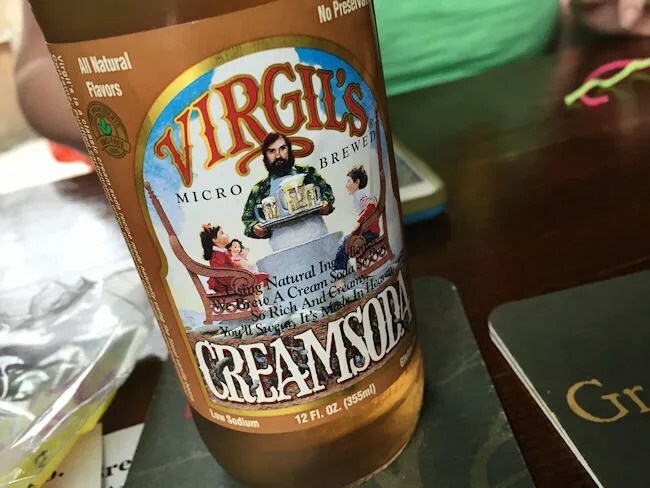 Greenbush has none of that, so she just ordered a Virgil’s Cream Soda. We brought a cup of water in for L, but we were sitting next to the self serve water cooler so we could have done that had we not brought her cup. The menu has changed and expanded quite a bit since the last time I was at the brewery in summer of 2012. It used to be just a handful of deli sandwiches, but now they have a full menu featuring BBQ, sandwiches, pizzas, and a handful of entrees. So much looked good on the menu including an incredible looking Hot Brown, but I just can’t pass up Pastrami. 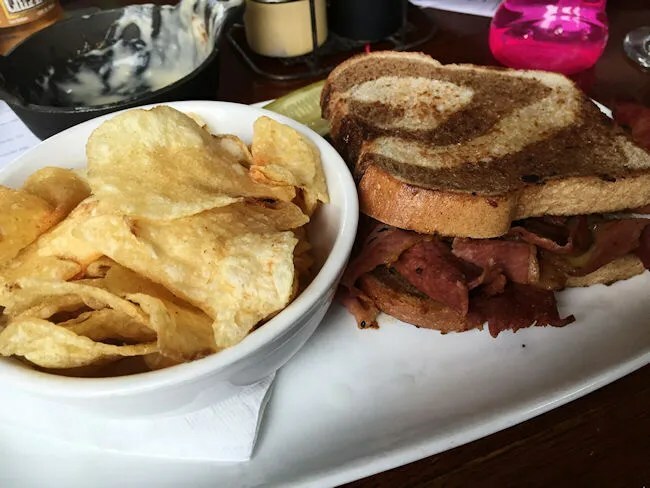 Greenbush’s version of the Pastrami sandwich is actually house-brined and smoked. It’s topped with a mustard BBQ and served on toasted rye with choice of side. Holy cow was this a delicious sandwich. The pastrami had a pretty thick cut to it and it had that amazing peppery flavor that lingered with every bite. I don’t typically like mustard BBQ sauces, but this one worked perfectly on the sandwich. There was just a little dab right in the middle of the meat and it was just enough of that vinegary flavor to work with the delicious pastrami. For side choice, I went with the kettle chips. Not 100% certain, but they seemed like out of the bag chips. Nothing special, but a nice side to the sandwich. J ordered the House-Smoked Pulled Pork which is served on a roll to make it a sandwich. The sandwich came without sauce on it and J didn’t realize that our waitress had brought sauce to the table with silverware. 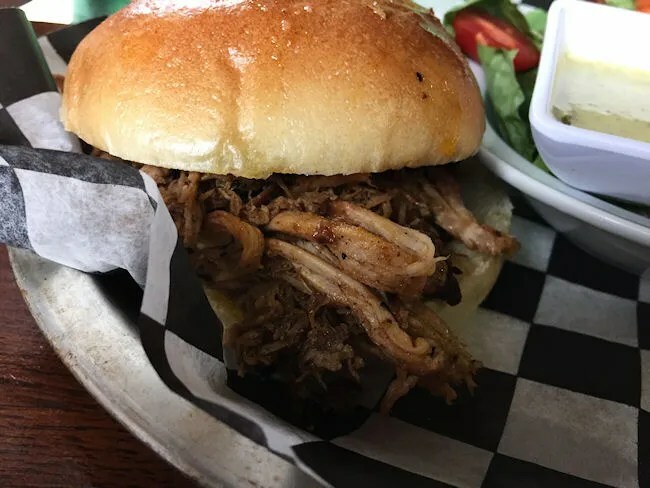 It’s very unusual for J to like a pulled pork without sauce, but she didn’t even notice nor seem care that this sandwich was served without it. The meat was so juicy, so tender, and so flavorful on it’s own that it didn’t even need one of their home made sauces. Her sandwich also came with a choice of side. She chose the side salad. 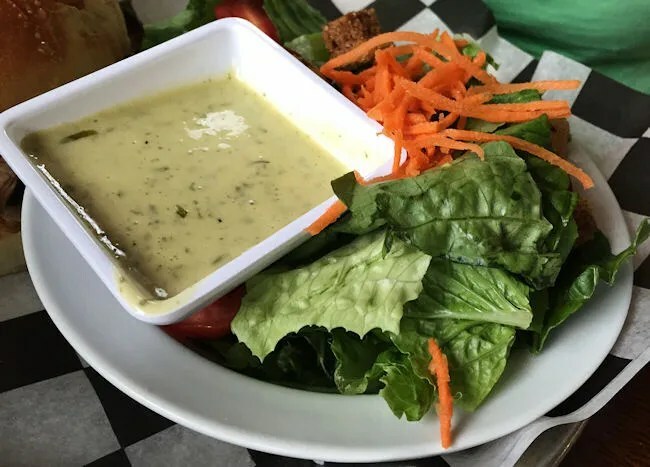 It’s a simple salad of greens, shredded carrots, and croutons with what I believe was an Italian dressing. When the hostess showed us to the table, she brought some Wikki Sticks for L to play. This is probably the best thing we’ve ever gotten from a restaurant for the kid. She had so much fun building and trying to spell her name. It was really a great time filler whereas she typically gets bored of crayons after a few minutes. These kept her busy the entire time and we actually ordered some off Amazon as we were sitting there because they were such a great idea for something to do in a restaurant. Along with those Wikki Sticks, the waitress set down a kids menu. J didn’t notice it at first and was just going to order her the Entrée portion Mac & Cheese. I pointed out the kids menu and we ended up getting her the kids portion….actually, L ordered herself the kids portion of Mac & Cheese. Our waitress didn’t even get a chance to take drink orders before L started telling her she wanted Mac & Cheese and chips. 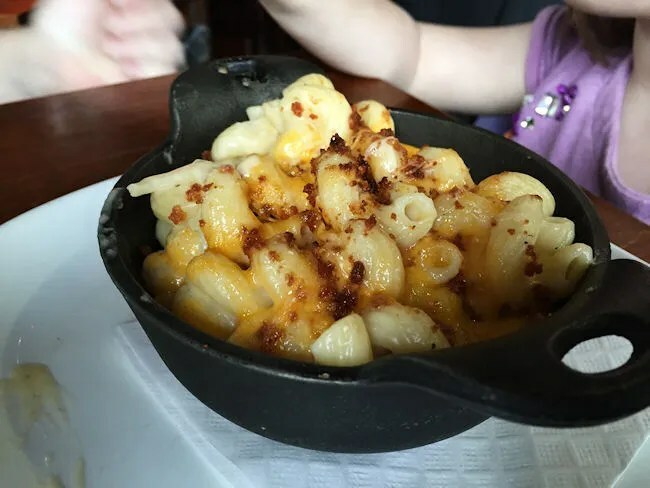 The kids’ Mac & Cheese is the same dish as the entrée just a little smaller. It’s cavatappi pasta in a cheddar-parmesan cream sauce that’s topped with shredded cheddar cheese and a cheddar-biscuit crunch. L really liked it. I mean, she ate almost the whole thing really liked it. We didn’t have to force her to eat or bribe her or anything. She picked up her fork and went to town. She used to eat that way all the time, but it’s been a while since she’s done that…it just shows how good this pasta was. Our bill for the three meals and one beer came out to exactly $35. J was a little on the fence at first about going to Sawyer so soon after having the baby, but he slept the entire time we were gone and J was very happy we chose to make the trip. Greenbush Brewing Company just keeps getting better and better. It used to be Sawyer was only known for the TA Truck Stop and for the Lion’s Den. Greenbush is changing that. 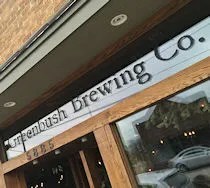 The name Sawyer is becoming synonymous with great beer and Greenbush is making that happen.